No detail was too small to be overlooked in the complete renovation of this stunning Palm Springs estate. 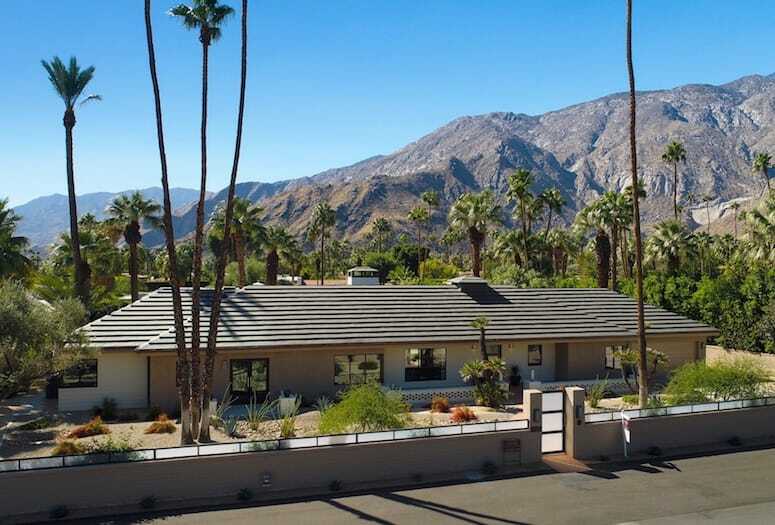 Built in 1948, this Old Las Palmas home in Palm Springs was recently restored to its early-midcentury style by designer Michael Koski. The classic U-shaped floor plan has a generous-size living room at its center that features tall, pitched ceilings and a wood-burning fireplace with an elegant limestone surround and a custom, wood-panelled over mantel. The voluminous, open feel of the home continues in the two master suites, hallways, dining room, and kitchen where the ceilings have been raised from eight feet to ten feet. Beautiful 20-inch-square porcelain tile flows throughout the living areas of the over 3,500-square-foot, five-bedroom, seven-bathroom home. (All of the bedrooms are newly carpeted.) There are two master suites, which are separated from one another, and all five bedrooms are en-suite. Like the rest of the estate, the large pool has been remodelled and has new equipment. There’s also a half-bath in the den and a powder room off the foyer. Trim tile in the master shower includes stainless steel decorative tiles and all the hardware throughout the bathroom is Hans Grohe. The serene color palette of tile and trim varies from one bathroom to another but each one has new tile, countertops, and custom-built cabinetry. The large kitchen opens to the dining room and is outfitted with Caesarstone countertops with a waterfall edge, a glass backsplash, Italian veneer cabinets fabricated locally by Agan Woodcrafters, and KitchenAid appliances. The high-end finishes in the adjacent laundry room—where you’ll have the added convenience of a second dishwasher, as well as scullery sink—are the same as in the kitchen. 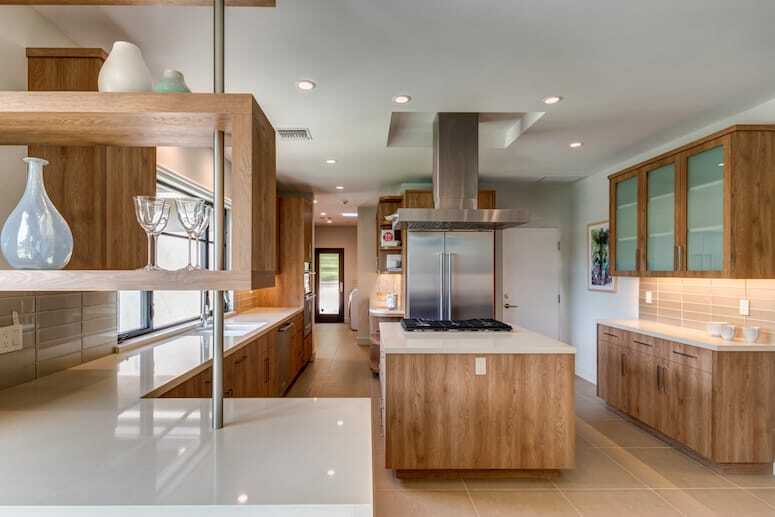 The large kitchen opens to the dining room and is outfitted with Caesarstone countertops with a waterfall edge. The conscientious restoration of the home took an eco-friendly approach that included replacing all the windows and doors with energy-efficient dual-pane glazing; installing new air conditioning and heating systems, tankless water heaters, and LED lighting; and the addition of a unique copper roof whose material is said to have been left over from the construction of the Bob Hope house. Outdoors you’ll enjoy your own private oasis in a big backyard with an incredible, uninterrupted view of the San Jacinto Mountains. Like the rest of the estate, the large pool has been remodelled and has new equipment. There’s also a spa patio with direct access to three of the five bedroom suites. The lot has been sensitively re-landscaped and includes many desertscape plantings. And there’s room for the addition of a casita or outdoor kitchen. The classic U-shaped floor plan has a generous-size living room at its center that features tall, pitched ceilings and a wood-burning fireplace.